Two Views self catering apartments are located in the peaceful holiday village of Pennington. The units consist of the upstairs Main House which has 4 bedrooms and can sleep 8, and the downstairs apartment which has two bedrooms and can sleep 4. Both units rented out together can sleep 12 people. This secure property boasts lovely sea views and three of the bedrooms in the Main House have a sea view. The units are tastefully furnished and well equipped for a self catering holiday. 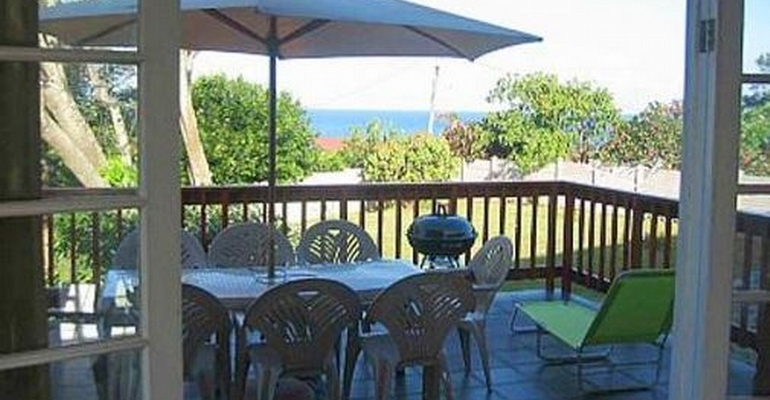 The house boasts lovely sea and river valley views from it's elevated position, one road back from the beach where you can swim, fish or snorkel or walk this beautiful stretch of unspoilt beach. Rates start at R1500 for up to 8 guests, R2000 for 12 guests. Discounts are offered for 7 night stay and longer.